Katrina Anderson and Rosie Donegan collected championship medals on the final day of the 2018 Australian Athletics Championships and Commonwealth Games Trials in a hot and torrid day of competition. Anderson ran 2:03.22 to cross the line fourth behind Brittany McGowan, Angie Petty (NZ) and Georgia Griffith to record a new personal best and break the MUAC 800m record. Donegan, part of a trio of MUAC women in the 3000m Steeplechase, ran a CGB qualifier 9:50.61 to finish in third place behind Vic Mitchell and Paige Campbell. Stella Radford was just one place back in fourth (10:03.25) with Ruby Turner also running well in 15th (12:28.16). Ellen Schaef took second in the B 800m final in 2:06.81 while Sarah Billings backed up her 4th in the same race (2:07.42) with fourth representing Victoria in the 4x400m. 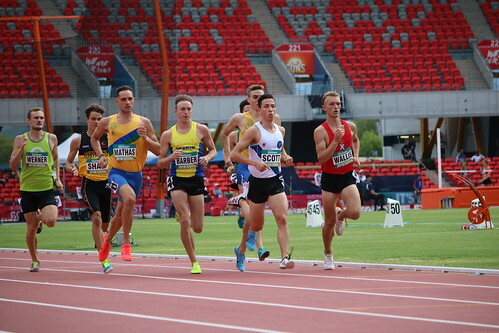 Matt Scott claimed a team gold with the Vic 4x400m team after his impressive run yesterday in the 800m final. Joel Baden jumped yet another CGB qualifier, clearing 2.21m to take 2nd behind Brandon Starc. Starc’s 2.28m CGA jump opens up two additional spots on the Australian team and Baden has placed himself in good position with team selection taking place tomorrow. Joseph Baldwin’s 2.10m clearance drove him into 5th place. Matt Scott was in esteemed company in the 800m final and showed he belonged, clocking 1:47.79 for 6th place after some savvy racing through the first 600m. Georgia Hansen ran smart and strong again over 1500m to claim 8th place in the final, running 4:14.71. It was a tough day for the MUAC decathlon boys with Jarrod Pageot unfortunately fouling his three discus throws and missing out on points. He finished in 11th on 6393 two places behind Christian Paynter on 6571 points, who collected 4 event PBs and an overall PB. Gabriel Cole ran 13.07 in the ambulant 100m heats for a 80.47% performance. MUAC’s quartet of 800m women all progressed to the finals with Katrina Anderson making the A final and Catriona Bisset, Sarah Billings and Ellen Schaef all qualifying for the B final. Anderson ran strongly to follow Georgia Griffith home to run 2:05.48 to get the small ‘q’ for the A final. The three remaining MUAC women all clocked sub 2:07.5 to comfortably make the B final. Harry Kimpton-Moss just missed the 400m hurdles final, running 53.26 for 10th place. Rosie Donegan took 10th in a spirited 5000m race, running 16:21.97 behind a passel of Olympians, and will be back in action on Sunday in the steeplechase. MUAC’s hard men of the decathlon, Jarrod Pageot and Christian Paynter were racking up points all day, with Pageot sitting in 5th place, just 180 points from the podium at the end of Day 1. Paynter had smashed the shot put, recording the biggest score of the day with a 14.91m put to score 784 points. Linda Leverton jumped to 7th with 12.76m in the final of the Women’s Triple Jump with Denis Finnegan also leaping to 7th place in the Men’s Triple Jump with a performance of 14.80m. 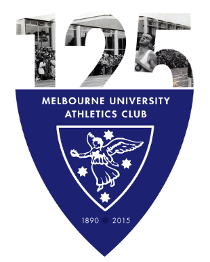 The 95th AAC and Comm Games Trials started in auspicious style for MUAC with four athletes progressing to finals after good performances. Matt Scott claimed the first spot in the hotly contest 800m final, running from the front to win his heat in 1:48.50 and will line up against 3 Olympians and the Australian Record holder on Saturday. Georgia Hansen ran very well to take 5th in her 1500m heat in 4:15.19 and progress comfortably to the final. Denis Finnegan’s 15.00m triple jump finds him ranked 8th going into the final after taking 4th in his heat. Linda Leverton jumped to 3rd in her triple jump heat, with 12.24m her best and will start the final ranked 7th. MUAC’s trio of pole vaulters jumped well in a comp where 3.85m was needed to make the final. Kath Iannello topped the Uni trio, clearing 3.60m, with Tamara Mancuso and Kate Abfalter soaring over 3.40m.